With Bride’s Magazine suggesting that the average couple spend a year completing a 44-item checklist, in 2013, the average wedding cost $29,814. Fifty-five years ago that checklist numbered 22 and we were supposed to spend two months preparing. Even our ring behavior has changed. Before World War II, 10 percent of all brides got diamond wedding rings. By 2000, the proportion had risen to 80 percent. Correlating the cost of weddings and divorce for more than 3,000 “ever-married” individuals, one group of researchers concluded that women spending more than $20,000 on a wedding were 3.5 times more likely to divorce than those whose wedding cost $5,000 to $10,000. Where are we going? To behavioral economics, and how marriage and divorce have changed. We really should start with Nobel Laureate Gary Becker (1930-2014). Saying the family is a production unit, in his 1981 “Treatise on the Family” paper and two decades of work that preceded it, Becker described the division of labor between husbands and wives. At that time, most men went to work while women were the “domestic specialists” who managed the home and took care of the children. Becker said that men and women selected each other in marriage markets. Like all other markets, we had supply and demand. The men and women who were “bidding” for each had a value based on what they could contribute to their lives together. Now those contributions have changed. The pill made it easier for women to decide when they would have children. It empowered them to enter professions that were more time consuming and paid higher wages. Consequently, a new cohort of females became a different kind of wife. More valuable in marriage markets with fewer housewifely skills, the new wife was a companion. For her and her husband, marriage became a different kind of economic unit. In many households, both partners were earning income and both (or none) cooked. Washing machines, dishwashers and microwave ovens minimized chores. Day care and take-out entered their lives. With the division of labor changing, so too has the institution. As economists Justin Wolfers and Betsey Stevenson have pointed out, more marriages are about companionship rather than children. Instead of production complementarities, we have consumption complementarities. And that returns us to the cost of the wedding and the chance of divorce. Although no one is sure of the cause of the pricey wedding/divorce correlation, as economists we can return to tradeoffs. Deciding whether to cohabit, marry or divorce, couples compare the gains from marriage and the gains from being single. Now though, with consumption complementarities becoming more important, the tradeoffs have changed. 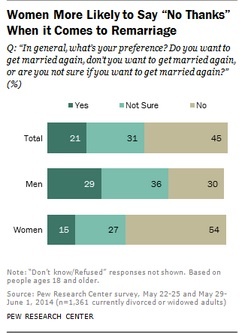 From the following Pew data, it appears that women and men have a different opinion of the tradeoffs of remarriage.